Japanese Episode 078: "Enter the Rival!" American Episode 224: "A Friend in Deed"
Satoshi's fifth match in the Sekiei Pokemon League is a while away so our heroes head to a nearby restaurant to relax. As they're leaving they meet a young boy named Hiroshi who they soon learn is also a competitor in the Pokemon League. 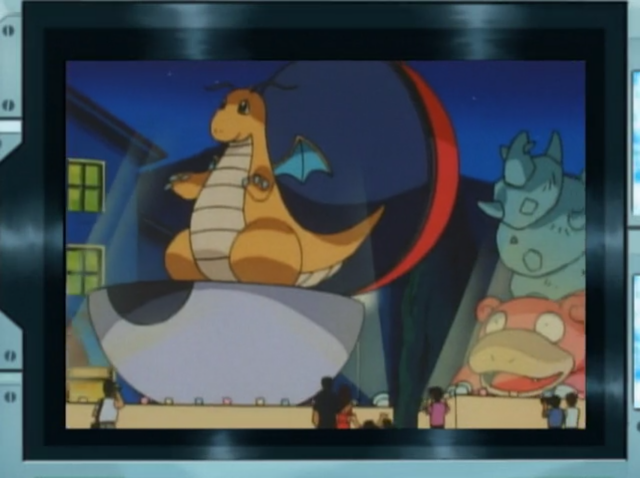 Some time later, the Rocket-Dan approaches the remaining Trainers in the Representative Village and trick them into handing over all their Monster Balls. 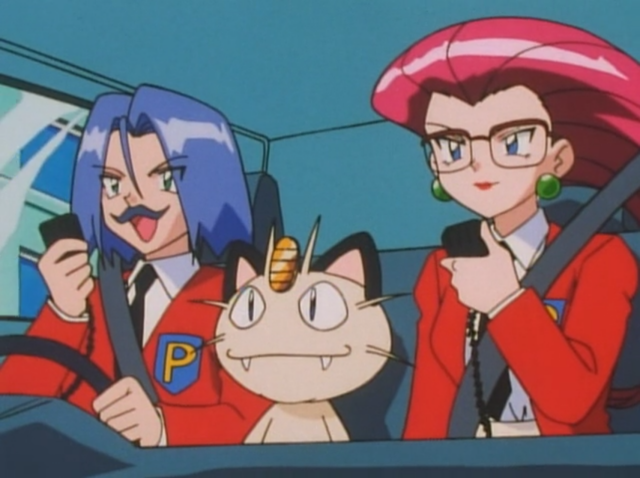 When our heroes see through the trio's disguises the villains drive off in their truck, leading Satoshi and Hiroshi, whose pokemon were also stolen, on a wild chase that takes them outside the village. 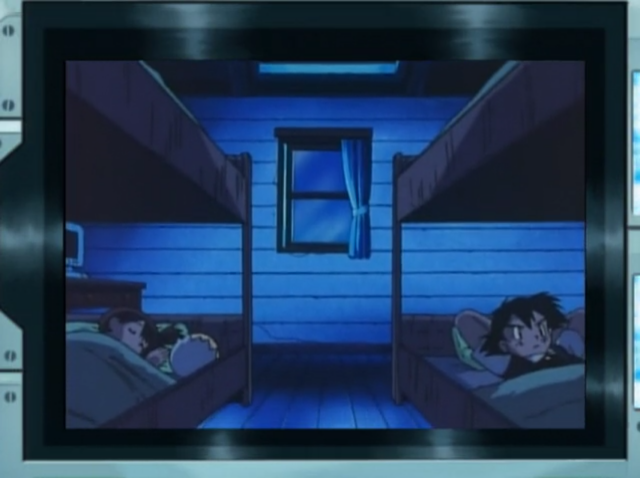 After a search that lasts all night Satoshi and Hiroshi finally find the trio and their getaway truck where they're keeping all the pokemon. They're about to free the hostages when Musashi, Kojirou, and Nyarth start to drive off with the young Trainers still inside! 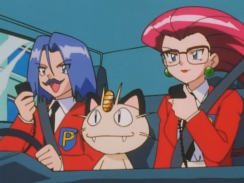 As the truck barrels down a mountainous road, Hiroshi sends out his pokemon – including a Pikachu he's nicknamed Léon – to send the Rocket trio blasting off. The rescued pokemon are all returned to their respective Trainers and the Pokemon League can resume as scheduled. 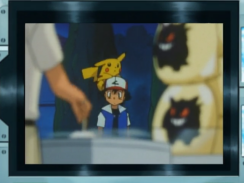 Later, Satoshi returns to the registration area to determine who he will be going up against in the fifth round. Much to everyone's surprise, Satoshi's opponent is none other than his new friend Hiroshi! Will these two be able to put aside their friendship to give everything they've got in their upcoming Pokemon League match? To be continued! When you look at the Sekiei Pokemon League you can see the show going through the growing pains of how to handle its big end-of-a-region tournament arcs. The pacing is all off. The battles are (mostly) poorly handled. There are far too many unevolved pokemon running around, for some reason. And Satoshi's main rival is introduced way, way too late. Now in pretty much every other Pokemon League from now until the end of time, we'll get at least a few episodes to get to know the person who will eventually defeat Satoshi in the tournament (whoops, spoiler alert!) before their big showdown. Who are they, where do they come from, what kind of personality they have, all that good stuff. Yet in this league we literally only get to meet the Trainer who will beat Satoshi one episode before his big victory. One episode! Why does Hiroshi end up getting about as much screentime as freaking Tohru, of all people!? I wonder if part of Hiroshi's absence during the earlier parts of the League have to do with him being voiced by Minami Takayama, a high profile voice actress who's most famous for playing Conan Edogawa in Detective Conan as well as Kiki in the Studio Ghibli classic Kiki's Delivery Service. 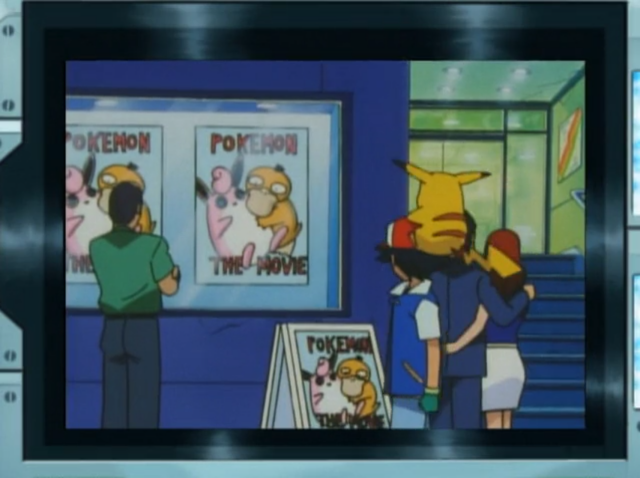 Like, Pocket Monsters was already a huge hit by the time this episode would have gone into production but would it have had the budget to have Ms. Takayama hang around for more than a few episodes back in 1998 / 1999? Regardless, the short time we get with Hiroshi does not do him any favors. I don't really feel like there's much to Satoshi's and Hiroshi's friendship, for example. 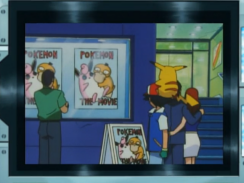 They're "good friends" because Hiroshi knows how to not get shocked by a Pikachu? 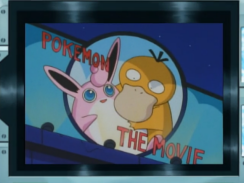 Because they stayed up late at night looking for images of pokemon in the starry sky? Because Hiroshi did what pretty much any other Character of the Day has done, and will do, when faced by a threat from the Rocket trio? The show tries to make it seem like the Satoshi and Hiroshi are these inseparable best friends so that the big reveal of them having to fight each other at the end of the episode is more shocking but it also isn't willing to do the prep work needed to make that reveal actually mean something. It also doesn't help that Hiroshi just comes off as a watered down Satoshi clone. Similar clothes, similar pokemon, similar personalities, similar naming scheme (his name's based on then-Nintendo CEO president Hiroshi Yamauchi who, like Shigeru Miyamoto, would have been seen as a rival to Satoshi Tajiri)...he's pretty much a carbon copy of our hero from Masara Town. I can appreciate that the series is trying to show off how even Trainers who apparently have similar backgrounds can go down different paths but a lot of what we're presented in this League just reeks of the sort of lazy writing that would be instantly rejected in this day and age. I know it sounds like I really hate this episode and that Hiroshi is the worst thing to ever come out of this show. I really don't. "Enter the Rival" had a lot of insane yet also fun little moments like Satoshi's mom breaking into a restaurant's kitchen in order to cook her son a meal (in violation of like a million health code regulations) or Hiroshi somehow knowing how to jump start an elevator. And Hiroshi is, for the most part, a pleasant enough kid. But seeing the show waste so much potential when I know it can do better, even this early on, is just frustrating. I want to feel like Hiroshi is his own character and I want to feel shocked when he's forced to go up against his friend in the fifth round but unfortunately the show isn't able to do that for me. 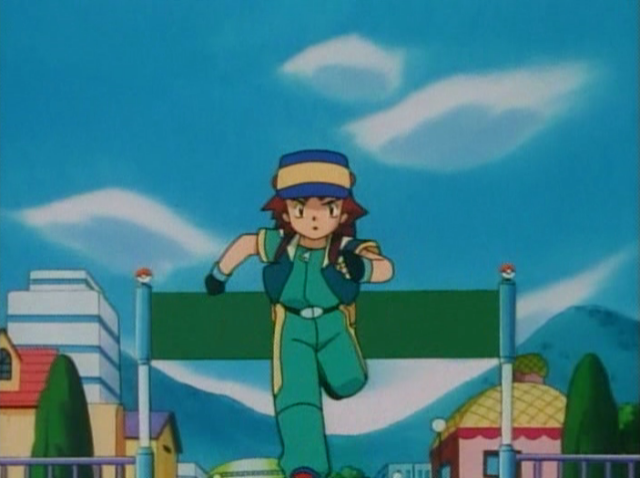 Tara Jayne voiced the Trainer who defeated Gary in the League and is also voicing the Trainer who will defeat Ash so I guess that's kind of interesting...? 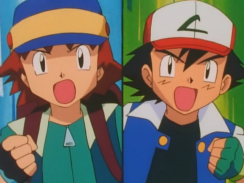 The dubbed version also gives us some great dialogue such as Delia's "But try to win," Ash's "Go...whoever you are!" and James' "Turn attack!" that show that not all of 4Kids' attempts at jokes are complete duds. I give the 4Kids dub a lot of flack because it's generally quite wretched but even my cold, black heart can find joy in some of the stuff they produce every now and then. Léon and Papi keep their Japanese voices. Misty: "Hey, I'm really hungry." 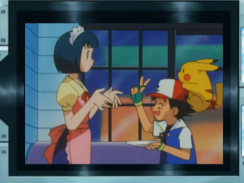 Brock: "We should all go out for a big meal to celebrate Ash's big victory." 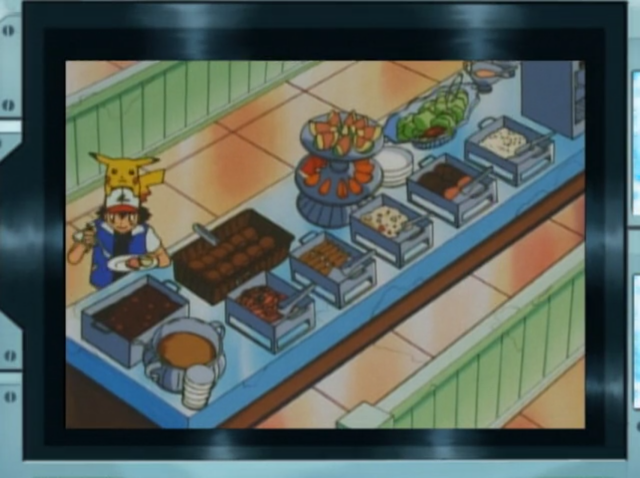 Ash: "And dinner's on me 'cause everyone in the Pokémon League eats for free!" Takeshi also mentions that they all have the day off tomorrow so they can afford to take it easy (明日は休みだ。今日は腹いっぱい食べてゆっくりしよう), something Brock fails to mention. Brock: "These croquettes are excellent." Misty: "No wonder the chef asked for the recipe." Originally Kasumi tells Satoshi's mom that this food has a taste to it that's different from what you can usually get in a restaurant (レストランの味とは違うはね). Professor Oak: "If you just remember to always do your best you're a winner, even if you lose. That's the important thing." In the Japanese version Dr. Orchid tells Satoshi to give his next battles everything he has so he doesn't end up having any regrets (まあ、とにかく悔いが残らないよう、全力を出して戦うことじゃ). He also adds that Satoshi's also fighting on behalf of Shigeru from this point onward (シゲルの分もな). Hanako then wishes her son good luck (頑張ってね). 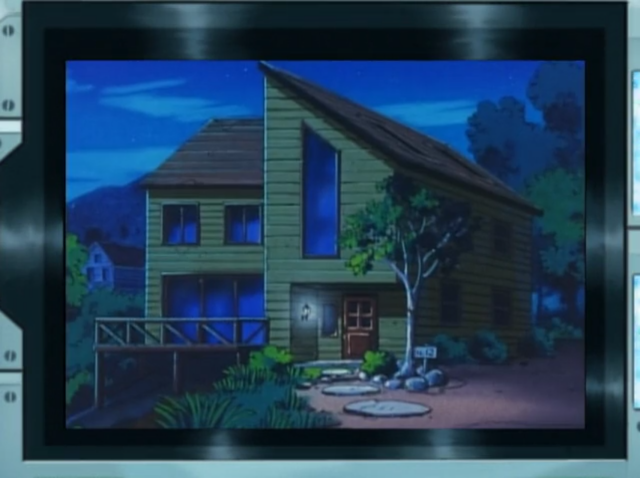 The "Pokémon Pavilion" the Rocket trio tells all the Trainers to report to is referred to as the Chuusen Kaijou (抽選会場) or "Lot-Drawing Hall" in the original. James: "We finally got Pikachu, Jessie." Ash: "Did you say Jessie!?" 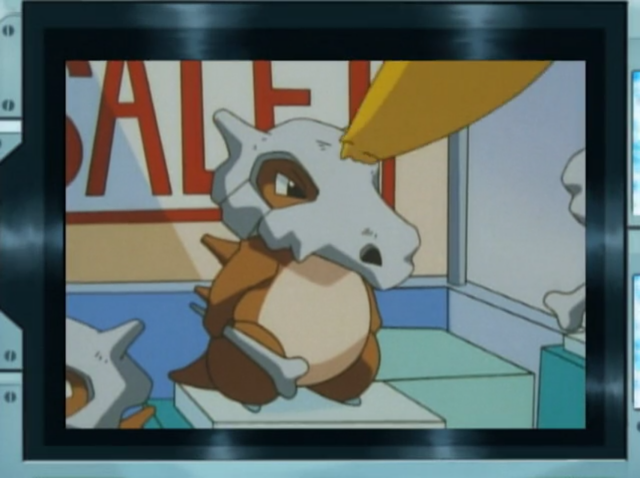 Ritchie: "Hey, you look a lot like those guys from Team Rocket." In the original Kojirou's slips up by saying "We got what we came here for" (頂くもん頂いたしねぇ). Satoshi repeats this back at him (頂いた？) and then adds that something doesn't seem right. Hiroshi joins in to say that this whole thing seems suspicious and asks the duo who they are (怪しい！君たちいったい何なの？). The English dub makes it sound like Ritchie is already familiar with the Rocket trio (otherwise how else would he know what they look like?) when no such implication is made in the original. The banner leading to the Representative Village gets erased for having the word "Sekiei" on it. 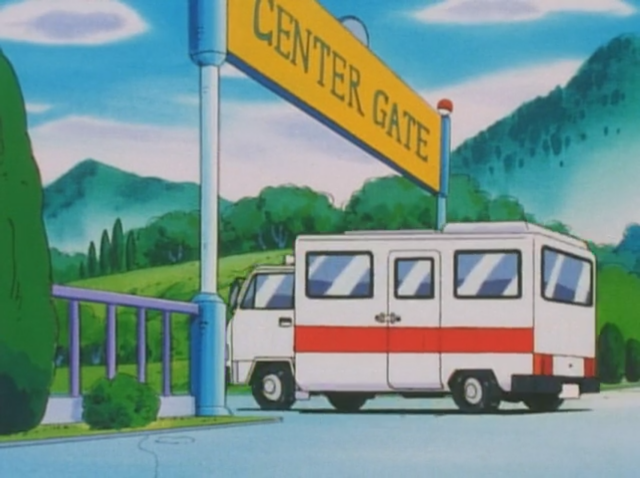 It would have been nice if 4Kids had replaced "Sekiei" with "Indigo" here but I suppose it's not implausible that a banner that says "Center Gate" on one side would be blank on the other. The Pokémon dub is just as whitewashed, if not more so, and so I half expected them to pull the same stunt here. But they didn't! In a show where people use American pennies and make references to American football teams and Hollywood, California and Miami Beach and the Fourth of July we're somehow allowed to see something as un-American as a truck with the steering wheel on the "wrong" side. I'm sure that if the Rocket trio didn't have those big red "R"s on their uniforms that would have had to be redrawn if the images were reversed (just like when Viz used to flip the manga back in the 90s) then 4Kids very much would have gone ahead and done that. Team Rocket: "A hundred Pokémon in the bag, a hundred Poké~"
In the Japanese version the Rocket trio is just singing indistinctly. 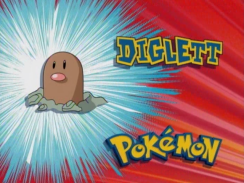 Guess which one of these pokemon actually appear in the episode! So I guess the previous episode's flirtation with sanity was just a one time fluke? Ritchie: "I got an extra sleeping bag right here. Haha...when you travel around as much as me you always carry an extra." Hiroshi also adds that he has food with him as well (寝袋や食料はあるよ). Ash: "Do you really think we'll ever see our Pokémon again?" Ritchie: "I know we will, Ash." Ritchie: "We'll start looking again at sunup tomorrow. Together I know we can find them." 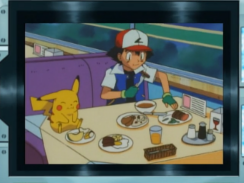 Originally Satoshi looks down at his dinner and wonders if his pokemon are hungry right now (あいつら、お腹空かしてるんじゃないかな). Hiroshi then cheers him up by telling him that they need to eat so they'll have the strength to look for them first thing tomorrow morning (夜が明けたから必ず助け出すさ。そのためにも力を付けななきゃ). 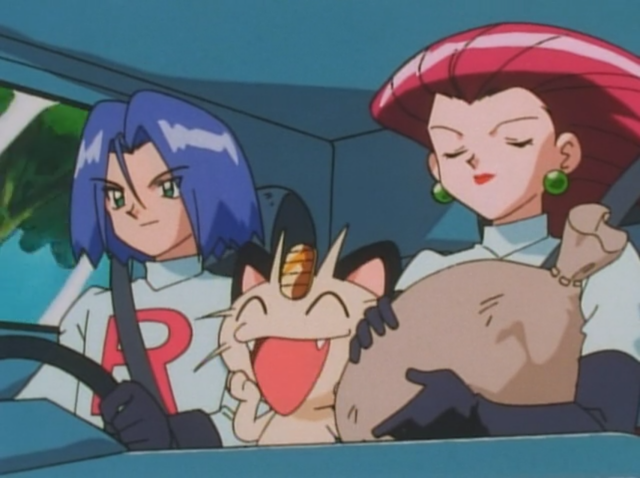 Team Rocket: "Hey, this van's a rental!" 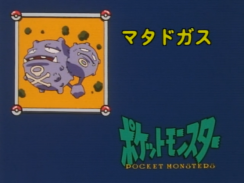 In the Japanese version the Rocket trio simply say "Wha-wha--what??" (なな何だ！？). James: "I should get a license." In the Japanese version Kojirou says zatto konna mon desu (雑 渡昆奈門です), or "Don't mention it" or "That was nothing." 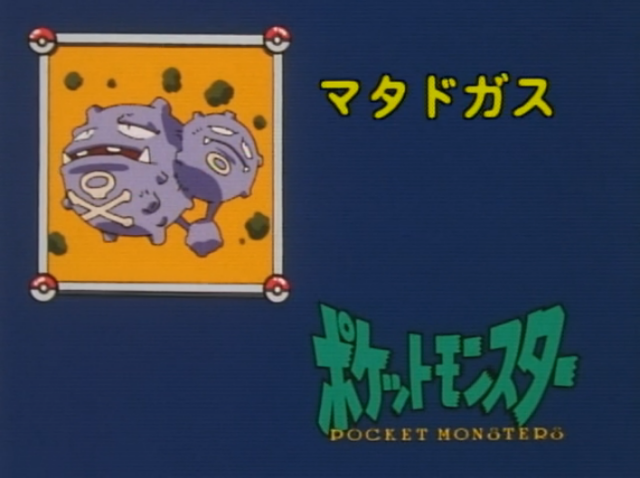 Later, we get introduced to Hiroshi's pokemon. Léon (レオン) gets renamed "Sparky" because we're not allowed to have a Pikachu in this show without a non-gimmicky name, I guess; Papi (パピー), which seems to come from the French word for butterfly papillon, gets changed to "Happy"; and Zippo (ジッポ) gets to keep its name. The latter is quite surprising considering that "Zippo" is very much the name of a brand of lighters, items that Kids' WB! has censored out of the show before. 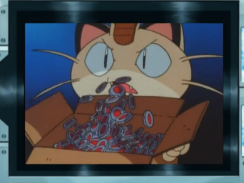 Jessie: "A hundred Pokémon in the bag, a hundred Pokémon..."
James: "If all of those Pokémon go free..."
Meowth: "Ain't no Pokémon for me!" 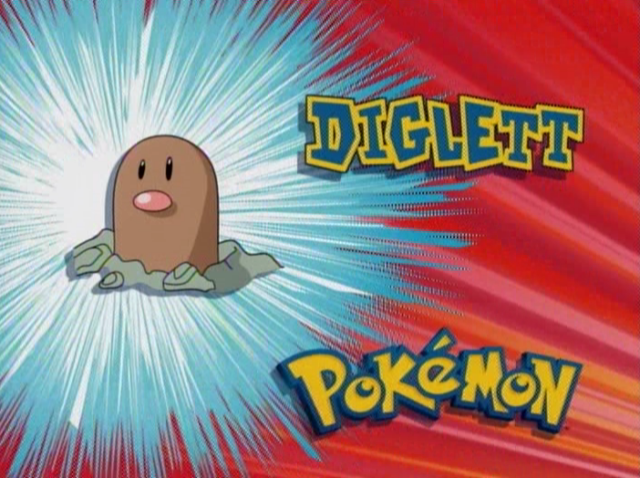 Originally the trio sings the same kind of nonsense song they sang earlier in the episode. 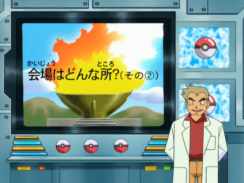 This week's "Dr. Orchid's Pokemon Course" segment is the second part of a lecture talking about the venue where the Sekiei Pokemon League is taking place. Dr. Orchid: "This time we'll be taking a close look at where the Pokemon League is taking place. 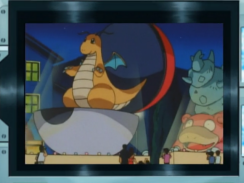 There are restaurants where both Trainers and pokemon can fill their stomachs. A lot of different dishes are available and both the participants and their friends get to eat for free. There are also tons of different events going on as well as souvenir stands selling rare merchandise that you can only get during the Pokemon League! The most popular items are pin badges but you should be on the lookout for counterfeits. There are movie theaters and other places to go for entertainment as well. And here's a cottage set up for the Trainers to spend the night. Hmm, it seems really comfortable, doesn't it? As you can see, the Pokemon League is a lively festival!" Nothing super exciting here but at least they're getting their money's worth out of that footage of Satoshi walking around the Representative Village, huh?